Robert Holcot was born in Holcot, near Northampton. He became a Dominican, and studied at Oxford, where he became Dominican regent master, before returning to the Dominican priory of Northampton, where he died of the plague in 1349. His most famous writings, as preserved in the present manuscript, derive from lectures on the biblical book of Wisdom, which he probably delivered at Cambridge. This manuscript was commissioned by a monk of Reading for his abbey. 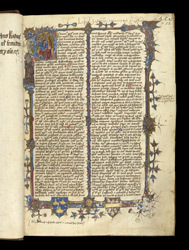 The first page of text is decorated with a historiated initial depicting the Virgin and Child; a kneeling monk (Thomas Besforde) praying to them from the adjacent border; and in the lower border the arms of Reading Abbey and the donor, Thomas Besforde.